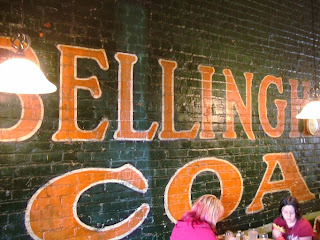 Decades ago, Bellingham had lots of coal mining. I think the last mine closed in the 1950s, but now Bellingham is center of another controversy. Shipping coal through Bellingham to Asia from places like Wyoming. Plans to build a new coal port north of Bellingham are controversial. Currently, some coal trains are headed through town to an already existing port in Canada. Asian markets are hungry, but should we continue developing a fossil fuel economy? See my blog entries on the coal train controversy. Above photo taken 2005 where side of building is incorporated into a restaurant.